42 mm stainless steel case with polished and satin finish, screw-down crown engraved with Tudor logo, bistable lockable chronograph pushers in steel with red and black markings at 2 o’clock and 4 o’clock, fixed black-lacquered steel bezel with 12 hour graduations, sapphire crystal, black dial, Tudor caliber 2892 self-winding movement with chronograph Fly-Back function, 60-minute totalizer at 9 o’clock, small seconds hand at 3 o’clock, date at 6 o’clock, approximately 42 hours of power reserve, black leather strap with large perforations, bracelet with folding clasp and safety catch. Water resistant to 500 ft (150 m). 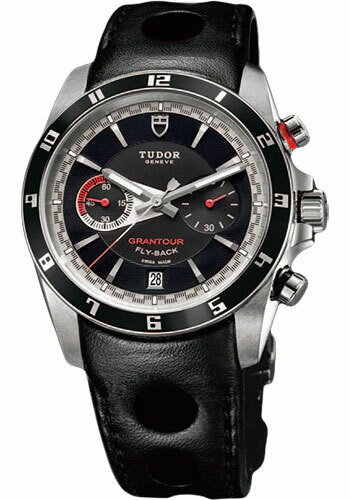 42 mm stainless steel case with polished and satin finish, screw-down crown engraved with Tudor logo, bistable lockable chronograph pushers in steel with red and black markings at 2 o’clock and 4 o’clock, fixed black-lacquered steel bezel with 12 hour graduations, sapphire crystal, silver dial, Tudor caliber 2892 self-winding movement with chronograph Fly-Back function, 60-minute totalizer at 9 o’clock, small seconds hand at 3 o’clock, date at 6 o’clock, approximately 42 hours of power reserve, black leather strap with large perforations, bracelet with folding clasp and safety catch. Water resistant to 500 ft (150 m). 42 mm stainless steel case with polished and satin finish, screw-down crown engraved with Tudor logo, bistable lockable chronograph pushers in steel with red and black markings at 2 o’clock and 4 o’clock, fixed black-lacquered steel bezel with 12 hour graduations, sapphire crystal, white dial, Tudor caliber 2892 self-winding movement with chronograph Fly-Back function, 60-minute totalizer at 9 o’clock, small seconds hand at 3 o’clock, date at 6 o’clock, approximately 42 hours of power reserve, black leather strap with large perforations, bracelet with folding clasp and safety catch. Water resistant to 500 ft (150 m).